Refurbished equestrian home, surrounded by rolling countryside, formal gardens and paddocks extending to just over 3 acres. Close to the popular villages of Newtown Linford and Woodhouse Eaves, Brook Cottage offers over 3100 sq ft of high quality accommodation which includes a 24' x 23' sitting room, fully bespoke kitchen, master bedroom with Juliet balcony and three bathroom/shower rooms. Nestled at the end of a long drive this four bedroom home has a particularly impressive approach and further benefits from three stables, double garage and lovely stones walls throughout the beautifully maintained grounds. 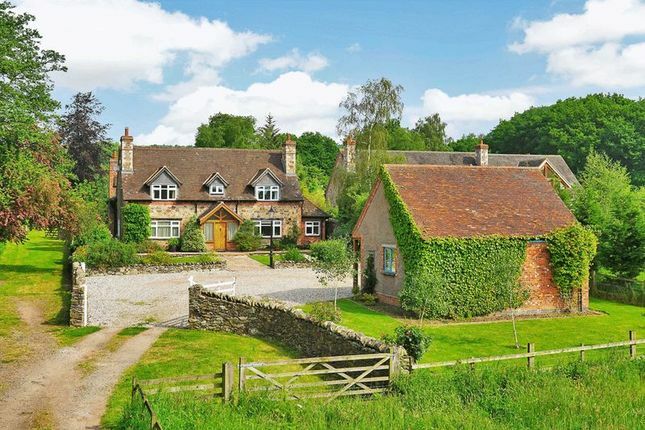 The property is entered through a heavily glazed, oak framed entrance porch with travertine marble floor extending throughout much of the ground floor. A large entrance hall with oak staircase and matching marble floor flows seamlessly into all three reception rooms and family kitchen. The sitting room is located to the rear of the property and is particularly spacious with oak flooring and wood burning stove set within an exposed brick inglenook. Two sets of French doors open onto the rear gardens and further oak double doors open into an adjoining dining room that is currently used as a home cinema with ceiling mounted projector and fully automated drop down screen. To the front is a family room with log burner and fully bespoke oak shelving, matching oak desk and storage cupboards. The kitchen is particularly spacious, enjoys a dual aspect and includes a generous dining area and pantry. Fitted with a range of oak fronted cabinets, marble worksurfacing and featuring a log fired Rayburn the kitchen also has a double Belfast sink and range of integrated appliances. French doors open to the rear garden and off the kitchen is a large utility room with sink, plumbing and external access to front and rear. The landing is spacious, has a high vaulted ceiling and provides access to four double bedrooms and family bathroom. Three of the bedrooms have fully bespoke fitted oak furniture and two bedrooms have the benefit of en suite shower rooms. The master bedroom is over the sitting room and features a high vaulted ceiling, French doors which open to a Juliet balcony and extensive range of fully bespoke fitted oak furniture. The en suite to the master is fitted with a white three piece suite, benefits from under floor heating and double shower enclosure. The family bathroom is fitted with a white three piece suite and also has the benefit of a tiled floor with under floor heating. Brook Cottage is nestled at the end of a long driveway which is owned by the property. A neighbour (former Ulverscroft Grange Nurseries) located beyond the western boundary has a right of access over the drive. A five bar gate provides access to a generous turning area at the front of the property, providing ample car standing and access to an open fronted double garage. Also to the front of the cottage is a large paddock, accessed through a five bar gate and range of wooden outbuilding that include three stables and garage. To the side of the property a drive provides vehicular access to the rear garden and further paddock through a five bar gate. The rear gardens are well established, beautifully maintained and enjoy exceptional views over the rear paddock and surrounding Charnwood Forest. Fully landscaped, the gardens are mainly laid to lawn, include a large paved terrace, built in barbeque and extensive stone walling throughout. The property has mains electricity and water, private drainage and lpg central heating. Fired by a Worcester boiler located in the loft, the property is heated by a combination of radiators and under floor heating (wet system) in sitting room, family bathroom and master en suite. The property also has the benefit of uPVC triple glazing. From Junction 22 of the M1 motorway follow the A50 in an easterly direction towards Leicester. Take the first available exit, following signs for Shepshed (B591). At the T junction turn right and then immediately right again on to Priory Lane. The property is situated the left hand side, identified by our For Sale board.